Unemployed and with nowhere to go, your chance to shine presents itself when your uncle offers up his rundown hamburger shack as a place to get back on track. It's not much to look at, but with a good helping of elbow grease, it's certain to see better days. Now if you could only stop that wily corporate shark from trying to take it over Get your career in full swing once again as you manage quaint cafes in locations all over the world. 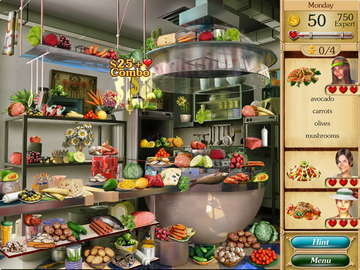 Search the kitchen to find necessary ingredients and fill your customer's orders for burgers, sandwiches, pizza, and more. With the money earned, you can then clean up cluttered storefronts, repair broken down bars, and outfit your restaurants with the finest furnishings available. In the title of the game it says Great Expectations, but unfortunately for most of the people it will end with expectations only. So what do we have here anyway? The story of the game goes that you have inherited your uncle’s job when you need it the most as the funds were going low and you needed a job fast. This job was perfect for you as it has got everything that it doesn’t need, and you’ve been itching for a challenge. The general idea of the game is something that I can rate with a max grade. We have seen many games with the similar or same themes on the market, but they kind of end up the same, with average results and nothing much accomplished as the content of the game isn’t anything new. So Alwar games like everyone from time to time tried to introduce a changed and new way of playing this game of mixed genres. The core of the game is pretty much unchanged, which is a good thing as this game wouldn’t be representing anything then. At the start of the game you decide then which mode of the game will you be playing: Timed or Relaxed mode. Besides the obvious difference there are a couple of other difference then need to be accounted for like the fact with the customers. You earn for the game by selling food. What you have inherited is a burger shop so there will be a lot of ‘junk’ food prepared and cooked so you can sell it to the customers. 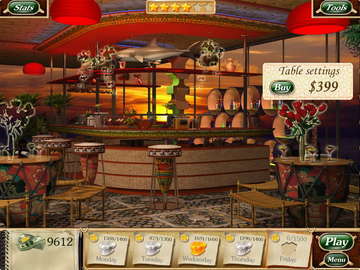 In timed mode, like in many other TM games, you will be restricted with the number of hearts (patience) that a customer has for you and the time you need to prepare their meal. The more you are late with the order the less money you will get and the other way around, while in relaxed mode there is no such thing and the customers are always jumping from joy. Everyday should be a new challenge which it is but the real challenge doesn’t lie in making the funds, as the part where the funds are being spent is what stands out in the game. Every day a new level is given, but besides the fact of pleasing the customers with their orders there is the part where developers tried to implement an everyday situation in the game, however they didn’t use that fact well that much. Like I said in the beginning of the review, they have added a new option that is quite uncommon in nowadays games. Besides the maintenance inside of the burger shop, you also have to keep your burger shop clean and sparkling outside. You’ll work through a group of customers in the same way each day, and will pass the level if you reach the monetary goal. 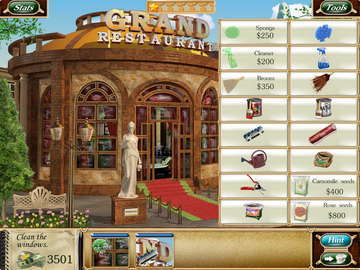 You’re then able to use your accumulated funds to fix up the restaurant itself. The clutter that you find inside the restaurant is all manageable and cleanable; expect the one in the kitchen which can’t be arranged because of the large menu that is available and pretty unusual when it comes to what the burger shop has to offer and by which prices. I mentioned previously that a burger shop normally serves junk food, but besides that there are a couple of meals like red Beluga caviar which kind of doesn’t make sense of serving in a burger shop especially with their prices. OK, it’s a game so that is negligible, but this causes a conflict between the new features outside and the ones inside. When you look at the interior, mostly menu you will see a lot of things are done in an unreal way. The outside additions are for which I liked the game, so you will judge it by your own criteria. A lot of painting, decorations and cleaning will be done around the shop and for that you need cleaning materials, painting materials, etc… This is usually done by just purchasing it and then for example choosing a color you want and so forth…but here everything that needs to be done, must be done strictly by you like in the physical world, manually. You will buy the necessary materials that you need and then using your mouse, will start brushing with them or painting or whatever the task is. Nothing has been left to chance, and every piece of scrap and decoration that needs to be place or replaced is there for you to do it. Now this means, probably your everyday chores, but a couple of clicks didn’t hurt me and it probably shouldn’t hurt you either. For me this was a great idea of releasing a new idea into this genre combination, but it only needs a couple of enhancements so it could provide a great result. The rest of the factors of the game like the graphics are something that characterizes such a well-known game manufacturing company, and the sound is not so far behind too. But alas the materials used here have great intentions, and not so good materialization. However with this lesson the next part of this game should receive a review full of praise if another company doesn’t use this idea full of potential for itself.